Registration: Registration is open and will close 5/8. The cost of the Academy covers lodging, training, and most meals. The Academy cost is the same for one class or multiple classes. 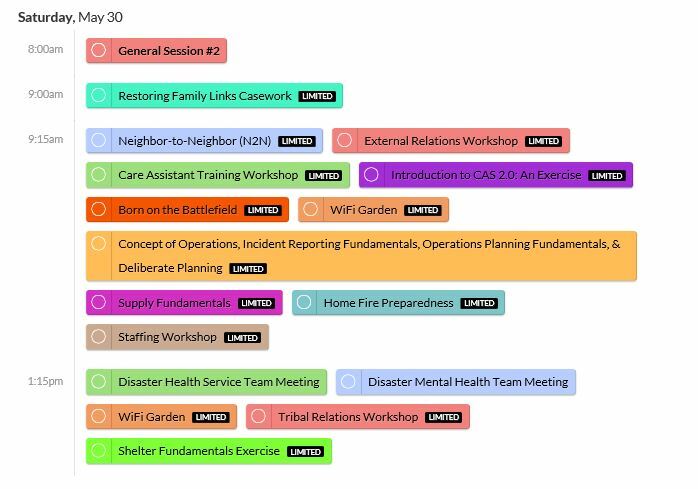 This year marks the 3rd Annual Cascades Disaster Academy and we're very excited that you are considering joining us for an outstanding weekend of training and networking. Out of respect for our donor dollars, this event has been planned with an eye toward creating the most comprehensive training event possible for the least cost and the least environmental impact. You will see this demonstrated by the facilities selected and the training methodologies. By making those choices, more volunteers and employees can be trained on how to provide vital services. You will have a choice between three tickets: Cascades Disaster Academy Commuter, Cascades Disaster Academy Overnighter, and Cascades Disaster Academy Overnighter Private Room. You will also be able to pay for and order a unisex 2015 Disaster Academy screen-printed T-shirt or an embroidered Polo. Both shirts are charcoal with the logo on the left chest. The logo to the right is this year's design. This will be a paperless event. We will not be printing course materials – you can download your materials before the event. You will be asked in the registration process if you have a device (i.e. laptop, tablet, Kindle, etc.) to bring with you; if not, a loaner will be provided at the event. If you want paper copies of your course materials, you will need to print those and bring them with you. You can download your materials from Sched.org after you pick your schedule. We will have "Gardeners" available to help you in the WiFi Garden if you need assistance with your downloads. We recommend you bring a lightweight jacket/rain slicker (just in case). Lodging will be available Thursday, May 28 through Saturday May 30 at the Willamette University dorms . Rooms will be double occupancy; each person will have their own bed. Rooms have restrooms and showers down the hall. If you have difficulty climbing stairs, please let us know on the registration so we can find you a first floor room. Classroom buildings have elevators; dorms do not. If you would like a private room at the Disaster Academy, there is a $75 fee (total cost $120 before May 5). The links to the right will help you as you make your decisions on which course are best for you to take. If you are having a hard time making a decision, you can email us at training.cascades@redcross.org and we'll be happy to help you; or check with your Disaster Program Manager or Activity Lead. The course catalog contains general descriptions of the courses being offered at most of the Pacific Division Institutes. 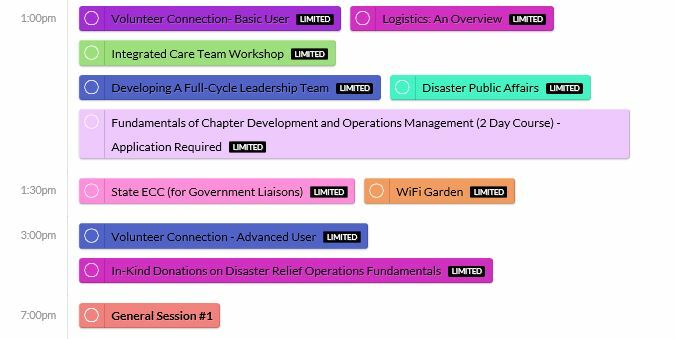 If you are interested in taking Service Delivery Site Management or Fundamentals of Disaster Chapter Operations Management, you will need to complete the advanced course application and return it to training.cascades@redcross.org. 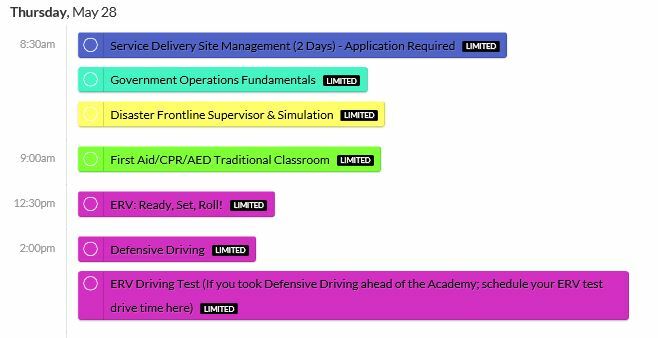 Below are the courses that will be offered. This means that classes until 5pm on Thursday are being held at our local Salem Office; you are responsible for your own evening meal on Thursday, May 28th.